My favorite lips are matte. No getting around it. There's something about matte lipsticks that work so well with my lips. Not sure why, but I get better staying power with mattes than I do any other formula. 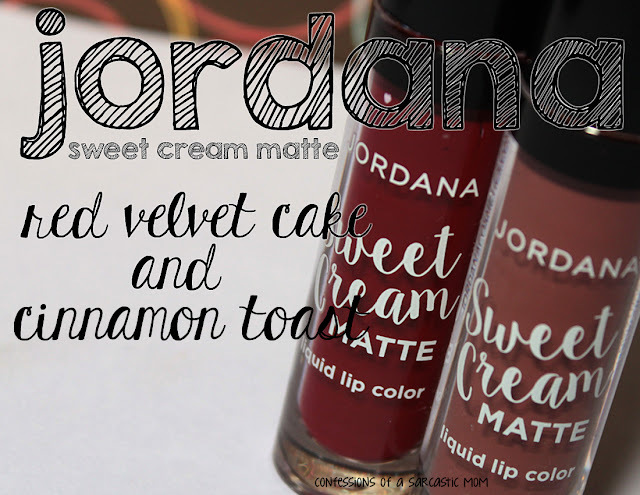 I was super excited to see some new Sweet Cream Mattes from Jordana pop up at my local Walgreens. When I say "local" I actually mean 2 towns and 20 minutes away hah! At any rate, I knew I had to check these out - so I picked up Red Velvet Cake and Cinnamon Toast! I guess you figured they had me at Red Velvet Cake right? It is indeed my favorite! 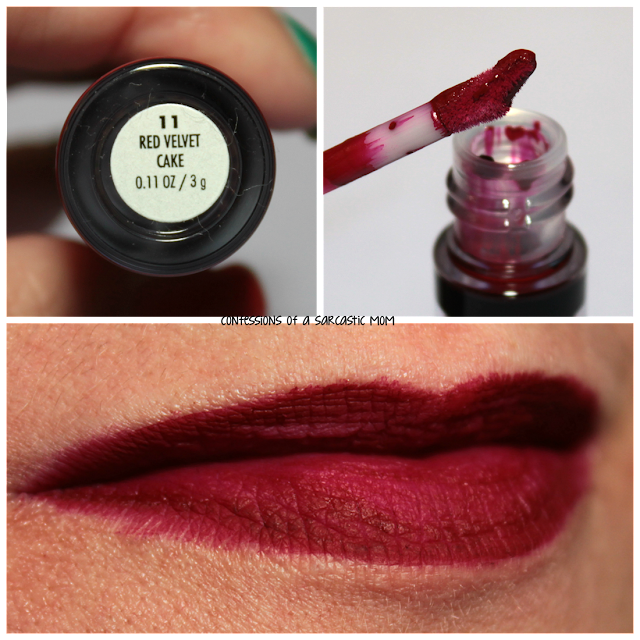 This is a deep, almost wine-colored shade, and it goes on super easy. 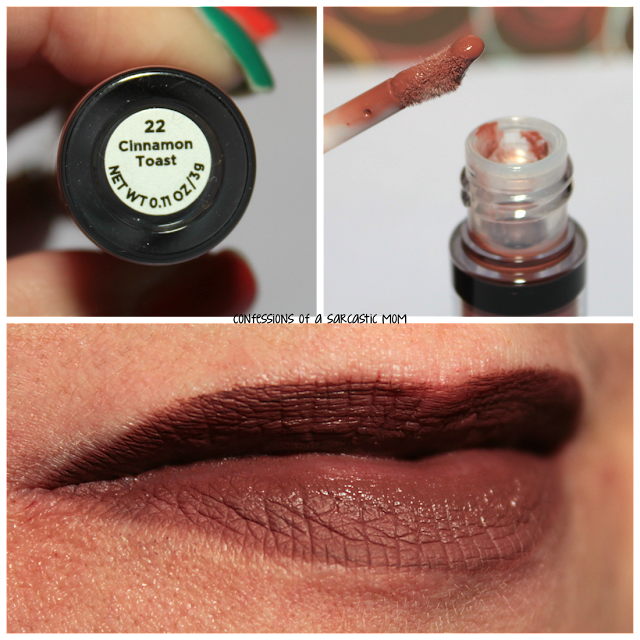 It's so pigmented it only took a few swipes across my lips for what's pictured. It dried down in no time flat, and I was left with this beautiful color. I didn't wear test this shade, but I did the other. Cinnamon Toast needed a little more dry time than Red Velvet Cake. You can see in my picture it still looks shiny around the inside of my lips, but it did fully dry to a matte after about 5 minutes. I don't know if I put it on too thick, or if it really just takes it that long to dry. I helped my friend with a Boy Scout banquet a few weeks ago, and I wore this lipstick. First of all, I got a ton of compliments. It's a beautiful shade, and apparently, it's a great shade for me (or maybe it just looked good with what I was wearing hehe). I put it on about 3 p.m., and went to help her. I may have mentioned before that I'm a lip licker. I lick my lips a lot. So if a lipstick can last a few hours on me, I call it good. These taste like, and some people may think I'm crazy, but I think they taste a bit sugary, like vanilla. I sat down with a plate of food at 7 p.m., and my lips were not only still covered, but they had not budged. I mean, it didn't start fading from the inside like most lip products do on me. These are keepers. Well, at least Cinnamon Toast is! Right now, at the time of this posting, it looks like the Jordana Cosmetics website is down. The site isn't the only place you can get these mattes - you can get them wherever Jordana is sold. Around here that's Walgreens, KMart, WalMart... just to name a few. You might try Amazon, too. I need to get some more colors. 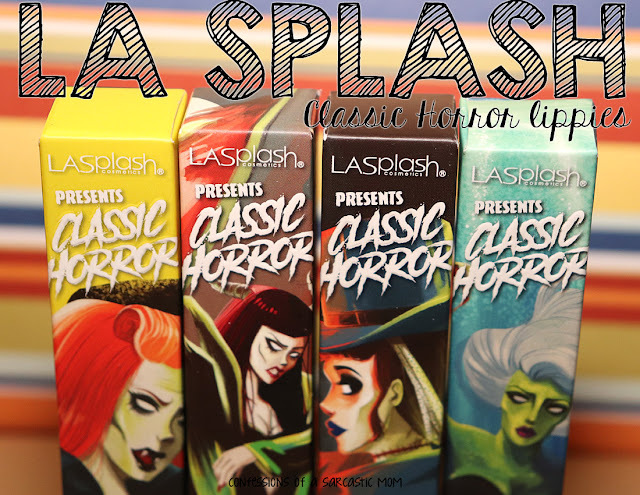 I liked these mattes that much! **DISCLAIMER** I was not paid for this review by anyone. I either purchased these products myself or was given it as a gift. The affiliate link contained in this post is from Amazon.com.